Established in 1867 in New Bern, North Carolina, the New Bern National Cemetery contains the remains of the Union soldiers, including 300 U.S. Colored Troops, originally buried throughout the Inner Banks region. The cemetery’s grounds are dotted with numerous private grave markers, and four large monuments erected by states to commemorate fallen Union soldiers. The rectangular cemetery is surrounded by an 1874 brick wall, with a rostrum and 1916 lodge situated on the grounds. As the Civil War began, the Union strategists looked upon New Bern as a critical junction. Not only was it a seaport, but the town was also an important stop along the Atlantic and North Carolina Railroad, which ran from a southern terminus at Beaufort, South Carolina north to Goldsboro, near Raleigh. In late 1861, Union forces began planning an assault on New Bern with Brigadier General Ambrose Burnside commanding what would become the nation’s first major amphibious force. In March 1862, the Union attack commenced. The three brigades (roughly 11,000 troops) landed at Slocum’s Creek, southeast of the town at the current site of the Cherry Point Marine Corps Air Station. The defending Confederate forces, comprised of inexperienced and ill-equipped troops led by a General with little military experience, were no match to Burnside’s forces. After six hours of fighting, the Union troops overtook New Bern’s defenses and occupied the town. In 1867, the New Bern National Cemetery was established north of downtown New Bern, a short distance from the western bank of the Neuse River. The cemetery is the final resting place for Union soldiers who perished in the battle for New Bern and other engagements in coastal North Carolina. Three hundred U.S. Colored Troops are interred in the national cemetery, as are more than 1,050 unknown soldiers. Today, more than 6,500 people are interred in the cemetery’s 7.7 acres. The cemetery closed to new interments in 1996. The New Bern National Cemetery is rectangular in shape with a central drive running the length through the property. A three-foot-tall brick wall dating to 1874 separates the cemetery’s perimeter from the surrounding residential neighborhood. Wrought-iron gates, installed in 1939, stand at the cemetery’s entrance on National Ave. The cemetery’s lodge and a utility building are located near the entrance. Originally, the cemetery contained a Second Empire-style lodge common to other Civil War-era national cemeteries. In 1916, the lodge was replaced with the current stone and frame two-story bungalow. 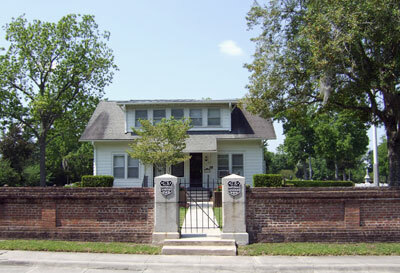 The cemetery’s brick and concrete utility building was originally built in 1932 and expanded in 1949. The cemetery’s rostrum, a raised speaking platform resembling a bandstand, is located in the northwest corner of the property and was constructed prior to 1900. The rostrum has an octagonal stone base with ornate cast-iron steps and railings. Between 1905 and 1908, four states erected commemorative monuments on the cemetery’s grounds to honor fallen Union soldiers. In 1905, New Jersey erected a monument to honor the state’s Ninth New Jersey Regiment Volunteer Infantry. 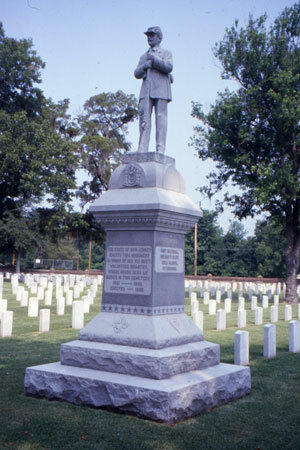 The memorial features a granite sculpture of a Union soldier atop a tall granite base. Inscriptions on the base list the battle sites at which the soldiers died, including New Bern. The governors of New Jersey and North Carolina, along with 5,000 others, attended the memorial’s dedication. A monument to Rhode Island soldiers was erected in 1906. Sculptor W. W. Manatt created a bronze statue of a woman, one hand extended and the other holding a wreath. The monument’s red granite base is inscribed with the names of the Rhode Island Regiments that fought in North Carolina. A gray granite memorial, erected by the state of Connecticut, honors troops who died from a yellow fever outbreak in 1864. The 1908 monument’s form suggests an obelisk with a flag draped over its top. A monument to Massachusetts soldiers was also erected in 1908. A bronze copper statue of a woman stands five feet tall. 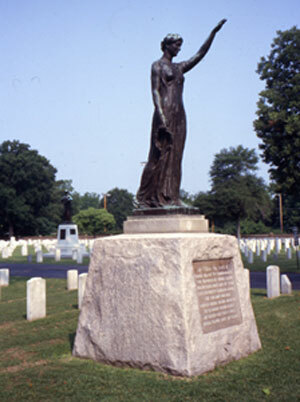 She holds a shield inscribed, “After loyal service union and peace.” The inscription on the monument’s base honors the Massachusetts soldiers and sailors who died in North Carolina. Massachusetts sculptor Melzar Mossman created the monument. A number of private monuments are also on the cemetery’s grounds. Families of the deceased typically erected these private memorials, which pre-date the standardization of markers in national cemeteries. The grave of Carrie E. Cutter, the first woman buried in the cemetery, is located in Section 10, grave 1698. Her grave supposedly lies next to her betrothed, Charles Plummer Tidd—a participant in John Brown’s raid and a sergeant in the 21st Massachusetts Regiment, although the grave is marked “Charles Coledge.” Ms. Cutter served as a nurse with the 21st Massachusetts Regiment in which her father was a surgeon. While assisting the sick and wounded aboard the Union transport vessel Northerner, she contracted yellow fever and died. She was originally buried on Roanoke Island next to Tidd, and her remains, and presumably those of Tidd, were later reinterred at New Bern National Cemetery. New Bern National Cemetery is located at 1711 National Ave. in New Bern, NC. The cemetery is open for visitation daily from sunrise to sunset; the administrative offices are open Monday to Friday from 7:30am to 4:00pm, and are closed on all Federal holidays except for Memorial Day and Veterans Day. For more information, please contact the cemetery office at 252-637-2912, or see the Department of Veterans Affairs website. While visiting, be mindful that our national cemeteries are hallowed ground and be respectful to all of our nation’s fallen soldiers and their families. Additional cemetery policies may be posted on site. New Bern National Cemetery was photographed to the standards established by the National Park Service’s Historic American Landscapes Survey.